Home > Brazil	> Rainforest in Transition: Is the Amazon Transforming before Our Eyes? The Amazon rainforest is in flux, thanks to agricultural expansion and climate change. In other words, humans have “become important agents of disturbance in the Amazon Basin,” as an international consortium of scientists wrote in a review of the state of the science on the world’s largest rainforest published in Nature on January 19. (Scientific American is part of Nature Publishing Group.) The dry season is growing longer in areas where humans have been clearing the trees—as has water discharge from Amazon River tributaries in those regions. Multiyear and more frequent severe droughts, like those in 2005 and 2010, are killing trees that humans don’t cut down as well as increasing the risks of more common fires (both man-made and otherwise). The trees are also growing fast—faster than expected for a “mature” rainforest—according to a network of measurements. The exact cause or causes of this accelerated growth—which means the Amazon’s 5 million square kilometers of trees are now sucking in and sequestering some 400 million metric tons of carbon per year, or enough to offset the annual greenhouse gas emissions of Japan—”remains unknown,” the researchers wrote in the review. “When we measure that a particular stand of mature forest is accumulating carbon, it is difficult to say whether that might be due to recovery from some unrecognized disturbance long ago or whether it is due to more recent changes in climate and CO2,” explained Woods Hole Research Center Senior Scientist and Executive Director Eric Davidson, lead author of the review, in an e-mail. Candidates include recovery from the potential wide-scale disturbance by pre-Columbian human societies now beginning to be uncovered or the increasing availability of some formerly limiting factor, such as atmospheric carbon dioxide. What is known is that the forest clearing that has already gone on is decreasing forest rainfall. The Amazon produces roughly a third of its own precipitation—trees release moist air that then falls back as rain to nourish other trees (the rest comes from the Atlantic Ocean). But the air above cleared land warms faster and therefore rises more quickly, drawing the moist air from surrounding forested areas away. In fact, the conjunction of cleared and forested lands actually creates wind known as a vegetation breeze. But that breeze tends to blow rainfall away from the forest and over the surrounding pastures instead. It also weakens the continental-scale low-pressure system that draws rainfall over the Amazon. The southern and eastern portions of the Amazon are the most affected, according to this review. 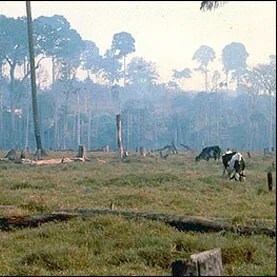 For example, the southeastern Amazon around one of the local tributary rivers—the Tocantins—has seen pasture and cropland increase from 30 percent to 50 percent of the land between 1955 and 1995. As a result, that river now carries 25 percent more water. Another southeastern tributary, the Araguaia, now carries 28 percent more sediment—precious soil lost during downpours from surrounding, expanded agricultural fields.